He was more than a figurehead. He was part of a village. Who would have known how weak he was – not me. He was proven. He had been part of our Christmas for over 25 years. That means he had survived my four children with nary a scratch. I never would have suspected that he would lose his head over a banana. If there is going to be a decapitation, it is better for your grandchild to do the dastardly deed than for your child to do it. There is ample forgiveness for the grandchildren who visit and then leave, who don’t wear you out with the everyday maintenance which they require, who haven’t been told 16 million times not to play with the Christmas village. The same act would likely have been met with frustration if one of my children had committed it. But my grandson. He can be destructive with a flair of adorableness. That face! How could I be upset with that face. From the other room I heard the sound of porcelain clinking – never a good sign. I looked around and Winston was nowhere to be seen. When last I saw him, he was holding (according to him) a perfectly yellow banana. I liked the way he appreciated little things like a bruiseless banana of perfect color. But the innocence of the moment was soon shattered. Little did I know that for some reason which escapes me, he was holding that banana over the unsuspecting head of the Christmas tree delivery man. Maybe he was counting people with the tip of it. Who knows, but evidently, even bananas which have not been peeled can be slippery because somehow or another, Winston knocked one figurine into another with said banana. “Everything alright in there?” I asked. I cautiously inspected the disturbing scene. The head was way beyond loose. It was severed! Right there, in front of the maid and two innocent children! Some in the village simply turned their backs to the gruesome sight, but I could not. Winston could not. He looked up at me with that beautiful, perfect banana in his hand, wondering what would happen. Well, of course, I cautioned him that bananas are not meant to be held over or placed among Christmas villages. The proof of the danger of this sadly lay before us. 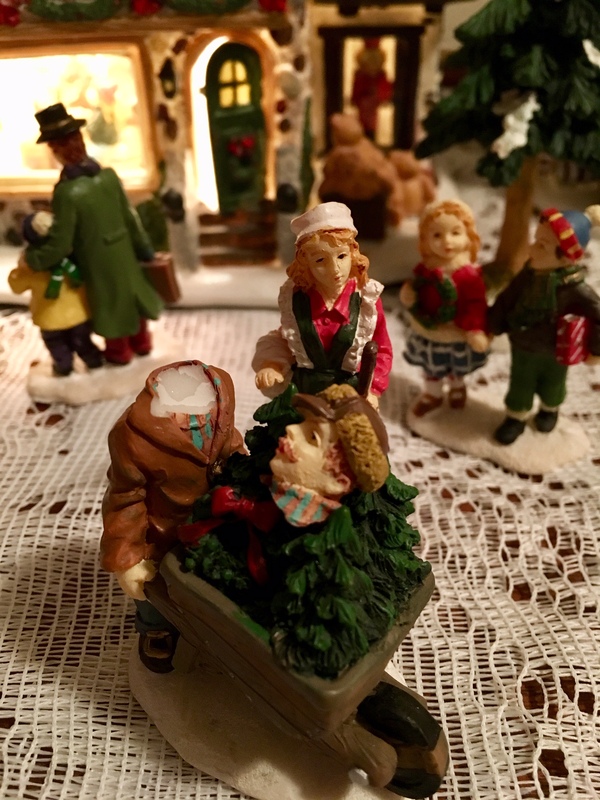 Then I put the severed head in the wheelbarrow and wheeled it over to my husband Bob’s desk. He has repaired a lot more than porcelain severed heads in his days as a father and grandfather and neighbor and friend. He has a reputation, and I am happy to tell you that he lived up to it. Mr. Tree Deliverer is back at work. The two children are in therapy but expected to put it behind them by New Year’s Day when they are packed up for the year. The warning of NO BANANAS has been emblazoned upon Winston’s mind. I’m just glad he wasn’t holding a pineapple. That could have been a real disaster.